Rival protests take place in troubled nation, as demonstrators set a statue of late former president Hugo Chávez alight in Bolívar state. At least four people have died following overnight clashes ahead of rival protests today in Venezuela by supporters and opponents of President Nicolás Maduro, police and a non-governmental organisation said. Police said the other three deaths occurred during looting in Bolívar City in the southeastern Bolívar state that borders Brazil. In a symbolic sign of the anger on display, a statue of Venezuela's iconic socialist revolutionary leader Hugo Chávez, Maduro's predecessor in office, was torched by dozens of protesters in the town of San Felix, Bolívar state. Photos and videos shared on social media showed the statue, which was vandalised last year, engulfed in flames. The opposition-controlled National Assembly announced today's protest action earlier this month as the legislature's president Juan Guaidó aims to rally support behind his attempt to chase Maduro from power and set up a transitional government ahead of new elections. The government responded by announcing its own pro-Maduro demonstration on what is a hugely significant date in Venezuela since it was on January 23, 1958 that the dictatorship of Marcos Pérez Jiménez fell. The Inter-American Commission on Human Rightstoday warned Maduro today that social protest and freedom of expression are "fundamental values" in any democratic society. The human rights body of the Organisation of American States says repression of demonstrations through excessive use of force may be a grave violation to fundamental rights. Maduro on Tuesday accused Washington of ordering a coup against his government and called for a "total revision" of ties with the United States. The Venezuelan leader was specifically reacting to comments by US Vice-President Mike Pence, who posted a video on Twitter branding Maduro "a dictator with no legitimate claim to power." Maduro responded during a radio and TV broadcast that "what the government of the United States did through Vice-President Mike Pence, was to give orders to carry out a coup from the fascist state... which is unparalleled in the history of relations between the United States and Venezuela in 200 years." 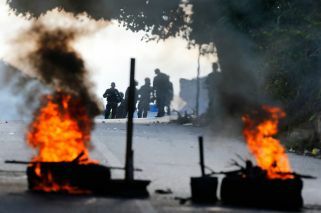 With Maduro's government ominously predicting there would be violence against opposition protesters, US Senator Marco Rubio warned Venezuela's intelligence service to "reconsider the plan they have before it's too late." "You are about to cross a line [and] trigger a response that believe me you are not prepared to face," the Florida Republican said on Twitter. Rubio urged prayers for "the thousands of Venezuelans who will face danger [and] difficulty in the hours ahead. May God give them strength. And may he change the hearts of military leaders so that they protect not repress their fellow countrymen." The Organisation of American States (OAS), which has declared Maduro's new term illegitimate, plans to hold an extraordinary session on Thursday to discuss "recent events in Venezuela." "Yankee go home! We won't let them interfere in the affairs of the homeland," Maduro's Vice-President Delcy Rodríguez said in televised remarks, while Communications Minister Jorge Rodríguez accused Pence of having ordered "terrorists" to carry out acts of violence during Wednesday's protest.